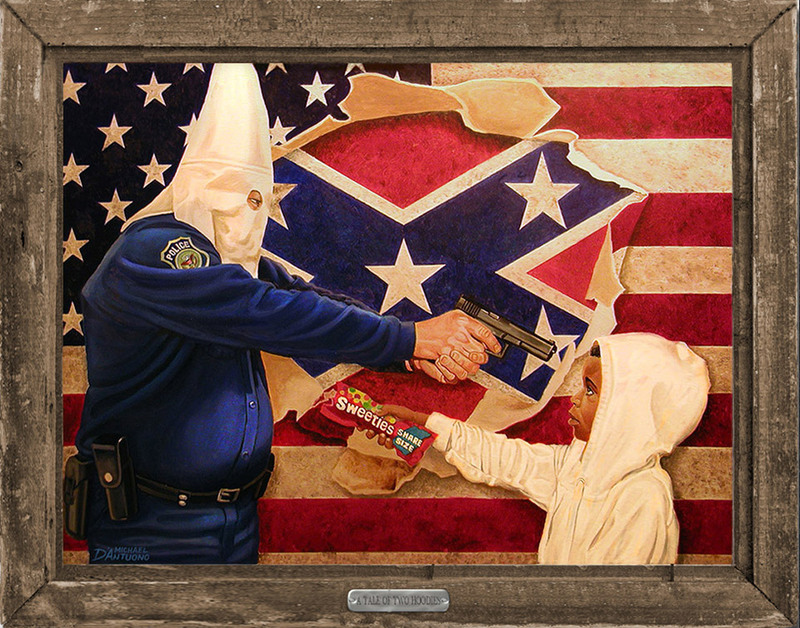 This painting, created during the Trayvon Martin case, symbolizes the travesty of racism in the criminal justice system. It has been the object of much controversy and censorship. In 2014, I was Incensed that George Zimmerman was trying to profit from his notoriety for killing an unarmed teenager by auctioning his painting on eBay. In response, I put this piece on eBay with half of the proceeds going to the Trayvon Martin Foundation. The very same day Zimmerman sold his painting for $100,000, and as soon as it became evident that my piece was on par to pass Zimmerman’s mark, eBay shut mine down for violating their strict policy of not selling anything on their site glorifying hate groups or showing anything symbolic of the Klu Klux Klan. The hypocrisy of eBay was that at the time they killed my auction, they were selling over 1500 other items related to the KKK. Misrepresenting it’s meaning, a hate group co-opted the piece in 2015, passing out flyers in Southfield, Michigan. In 2016, a high school teacher in Nevada, was suspended for using the painting to inspire critical thought.